Mission Possible with Timed Coupons! Mobile commerce has exploded in recent years, and mobile coupons are responsible for much of this growth. Thanks largely to a redemption rate 10 times that of print coupons, the number of mobile coupon users is expected to reach 53.2 million by 2014. 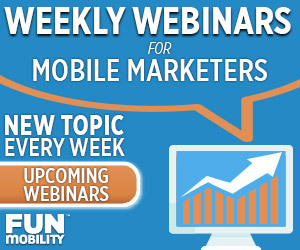 What have you found to be one of your biggest challenges with your Mobile Coupon marketing strategy? Our customers have spoken and we listened: Coupon Abuse. Mobile coupons are a great way for consumers to save money, but it’s not always easy to get everyone to play by the rules. A recent study confirmed this behavioral pattern and the potential for abuse. The most common type of mobile coupon abuse seen by retailers and in ecommerce is when intended single-use mobile coupons are used multiple times. With an expiration date far in the future, some consumers find it hard to resist repeat usage for extra savings. Others feel compelled to share the savings with their friends or upload the offer to coupon sharing sites. A mission that was once impossible, is now possible with FunMobility Timed Coupons. Until now, the only way a marketer could fight the abuse of their coupons was to rely on print offers collected at redemption or to have a point of sale (POS) system to govern redemptions through the use of dynamic coupon codes. Unfortunately this left the vast majority of marketers out of luck when it comes to tracking and the use of high converting mobile coupons. Our highly anticipated Timed Coupon feature is the perfect solution to save you time, save your customers money, prevent abuse, and make your customers ‘agents of redemption’. Customers are notified that, upon activating this particular type of coupon, they will have limited time to redeem it. When the coupon runs out of time, the experience will automatically change into a void coupon, which will let the consumer know it has expired. Timed Mobile Coupons impression, clips and redemptions can be tracked and represented in the FunMobility SaaS Platform. 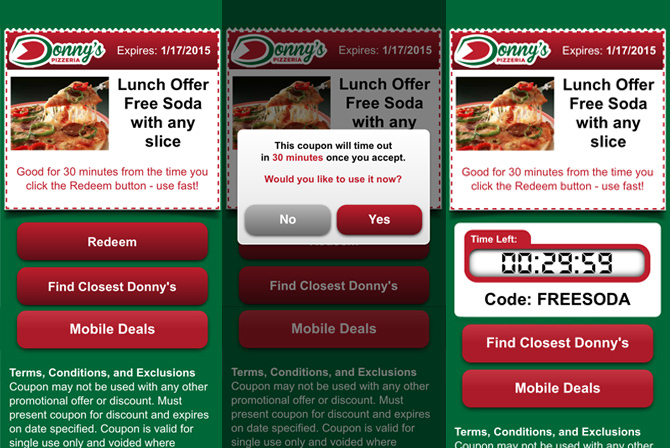 Like traditional interactive Mobile Coupons, Timed Mobile Coupons are equipped with opt-in mechanics to expand the acquisition footprint of your loyalty database. Location Finder allows consumers to use 10 closet redemption points from where they are currently located. Whether your POS system has a scanner or requires manual key-in, FunMobility Mobile Coupons can support static and dynamic codes in QR, UPC, PDF-417 and Text options. To redeem a timed coupon, consumers must activate the offer, which reveals the coupon code for a small window of time. Once the “live” countdown timer is up, the offer disappears and can’t be activated again. With “live” timed coupons; it becomes impossible for consumers to reuse by taking screenshots, or sharing the URL with others. You regain control of your coupon distribution, and your customers move faster to redeem their coupons before time runs out. The customer saves money, you save time policing your coupons, and you make money! It’s a win, win, win! If you choose to accept this Mission – Success is at your fingertips! There has never been a better time to work with FunMobility as a part of a successful customer loyalty program. Learn more about Timed Coupons, the new FunMobility Mobile Promotions Suite, and our successful customer loyalty programs, get a free demo today!